Supplemental notary stamps are both convenient and practical. Whether you are an experienced notary or a novice notary, the Self Inking Jurat Stamp will keep you prepared and professional. As a notary public, you may be asked to execute a jurat transaction. When performing a jurat notarization, the notary attests that the signer of the document has appeared before them and was given an oath or affirmation by the notary to confirm the validity of the document. The document is then to be signed by the oath-taker in the notary's presence. After a jurat has been performed, some states will require you to document the event. If there is not a notarial certificate attached or the required text on the document itself, you will be required to hand write all of the text which can be very time consuming. With that in mind, we created the Self Inking Notary Jurat stamp. 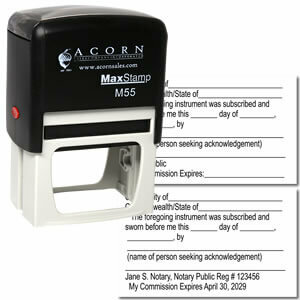 The Self Inking Notary Jurat Stamp can be used time and time again and is easy to re-ink. Unsure if this is the correct product for your notarial duties? Contact us! Save both time and money with the Self Inking Notary Jurat stamp. The Self Inking Notary Jurat stamp is durable and guarantees a great impression every time it is used. With just a bit of pressure to the top of the stamp, you will receive an impression that will provide you with the required verbiage to document your jurat notarization. You can expect to receive 5,000+ perfect impressions before the need to re-ink this stamp. When it comes time to re-ink, just simply slide the built in ink pad out, squeeze a few drops of ink and you are immediately ready to go! You will never be unprepared with your Self Inking Notary Jurat stamp.